I’ve told you before that I am a bit of a hoarder. I’m not particularly happy with this part of myself, but ah, there it is. I have culled down repeatedly, sifting through the kid’s drawings (read: every paper they ever touched with a writing utensil), school work, so many photos that if I put them together I could make a flip book of their entire young lives. But it did occur to me the other day, as senior year is approaching in a couple weeks, and the house at 24 Elm will no longer be a house with kids or students, that to make a new life, which the emptying of the nest forces you to do, I will have to unfeather the nest first. As I said, I go through spurts of emptying out the contents, of dumping the past into an extra strength Hefty bag, and giving away scads of clothes and toys, and games, but I never really complete the job. I never really pare down, as if holding onto that stuff will allow me to hold on to that time. Member the movie “Dave,” where Bonnie Hunt is a White House tour guide and she says, “We’re walking, we’re walking. And we’re stopping.” You can’t stop. You gotta keep walking. It seems more clear to me today, that holding onto that time doesn’t require holding onto those things. Also, by the way, you can’t hold onto any time, this life seems to work best when we keep moving forward. Step by step, staying in motion, advancing like the calendar. How can I give a welcoming bear hug to the next phase if I am still holding on for dear life, to the last phase? It seems like it would be easier if I could just have someone come in and remove the past from my house. 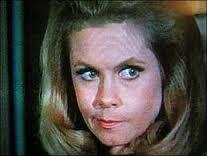 Like it would be really cool if Samantha from Bewitched could just screw up her nose and do that for me, rather than make me consider each piece of history that has made up my life, our lives. I hear she is a fictional character, so this is probably not going to happen. Which feels really unfortunate. By the way, in case you’re thinking, “Good God woman, this is the most basic thinking there is, how did you not know this?” I did know it, but sometimes the same information gets to a different part of your brain on different days, and actually makes a different kind of sense. That’s what happened yesterday. I got very clear about the need to make things different, on account of the big change that is coming. It’s essential to go with the flow and keep moving. Being stuck in the past, especially in the clutter of the past, won’t do. 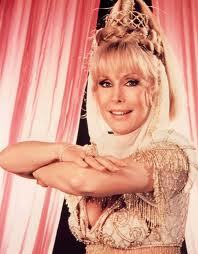 Maybe I dream of Jeannie will come and do her head bop thing and transform my past into my future. More than likely there is no magical cure to this excursion. We all have to do it ourselves.